The Rev. H. Eddie Fox reads the gospel lesson during morning worship at the 2008 United Methodist General Conference in Fort Worth, Texas. Fox has retired as head of World Methodist Evangelism after 25 years. The Rev. H. Eddie Fox was born in the Appalachian foothills and never saw an ocean until he was 21. But as head of World Methodist Evangelism, he traveled millions of miles to spread the gospel of Jesus Christ on every inhabited continent in the world. Fox has retired after 25 years encouraging evangelism around the world. The World Methodist Council is a worldwide association of 80 Methodist, Wesleyan and related Uniting and United Churches, including The United Methodist Church. The council represents more than 80.5 million people in 155 countries. It officially began in 1951, but dates its origin to a meeting of the Ecumenical Methodist Conference in 1881 at Wesley’s Chapel in London, which has been called one of the earliest organized Christian world communions. In 1971, the council launched World Methodist Evangelism to fulfill its vision of encouraging evangelism in every land. Fox became director of World Methodist Evangelism on Jan. 1, 1989, following the first full-time director, the Rev. Sir Alan Walker, a distinguished church and national leader from Sydney, Australia. During the past quarter of a century, Methodist/Wesleyan denominations worldwide have grown by a million members each year, Fox said. Connecting Congregations for Christ – A ministry which began after the collapse of communism in Czechoslovakia and spread throughout Eastern Europe, Africa, South America, Central America and Asia. Emerging congregations are connected through World Methodist Evangelism with enabling congregations in other parts of the world. In its first 20 years, 186 connections were established. Faith-Sharing Initiative – Thousands of Methodists have been trained in the graceful pattern of sharing Christian faith the Wesleyan way. The ministry was launched at the World Methodist Conference in 1996 in Rio with the release of the Faith-Sharing New Testament, which now has 850,000 copies in print in English and has been translated into 40 other languages. Order of the FLAME – Over 1,000 specially selected young pastors from Methodist/Wesleyan churches in North America, Africa and Northern Ireland have been energized and encouraged since 1996 by the Order of the FLAME (Faithful Leaders As Mission Evangelists). Youth conferences – More than 6,500 young people, ages 17-30, from 65 countries have participated in the life-changing conferences in England, the Bahamas, Australia, Mexico, Germany, United States, Northern Ireland, Brazil and Korea. Fox grew up in a country Methodist church on Waldens Creek in Sevier County, Tennessee. At age 9, he knew he wanted to follow Jesus, and at age 16 knew he wanted to be a preacher like his grandfather. The church gave him a license to preach when he was 17 years old. For six generations, since his ancestors moved in 1787 to a mountainous wilderness that later became part of Tennessee, Fox family members have been Methodists. “John Wesley was still alive, and my family was already Methodist,” Fox is fond of saying. 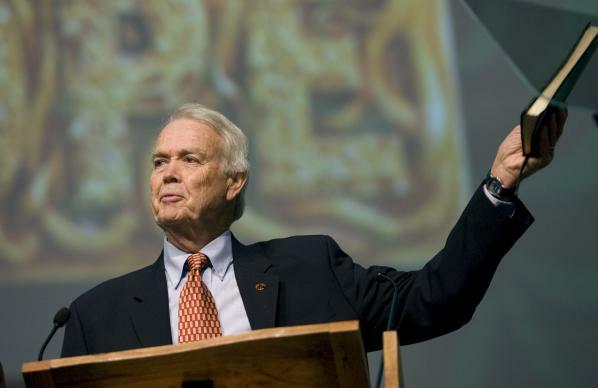 An ordained elder in the Holston Conference, Fox served churches in Virginia and Tennessee before joining the Board of Evangelism, which later became United Methodist Discipleship Ministries. He was there 15 years, and served as head of evangelism for the last six years. Fox also was on the faculty of Billy Graham School of Evangelism for 15 years. The Rev. Maxie Dunnam, a past president of the World Methodist Council, served for 20 years as the council’s chairman of world evangelism and headed the committee that selected Fox. Methodist/Wesleyan church leaders from more than 20 nations attended a celebration of his service in August, and others sent messages proclaiming their love for Fox and his wife, Mary Nell. “They were friends, and people who prayed for us, and stood with us and have helped us,” Fox said. Fox retired in September, but is staying on through March to provide transition for his successor. “One of Eddie's real gifts – he has a lot of gifts – but one of his real gifts has always been the ability to perceive the moment in both an immediate way, but also in a more strategic way,” said the Rev. Kimberly Reisman, a United Methodist evangelist from West Lafayette, Indiana, who is succeeding Fox as world director. Three years after he became world director, the Soviet Union ceased to exist, and Methodist churches forced underground for decades were able to begin re-emerging. Fox’s office — located in a converted house behind his home church in suburban Nashville — is like a travelogue of his decades of evangelistic work. At age 76, Fox does not use the word “retirement” to describe what lies ahead for him. Gillem is a writer and photographer in Brentwood, Tenn.